The magnificent Charterhouse and National Museum of San Martino is perched precariously on a hill high above Naples, just below the commanding fortress of Castel Sant’Elmo. Once home of Carthusian monks, expelled at the unification of Italy, the monastery complex is deceptively large with breathtaking views of the city and bay below. Here, for over 500 years, the devout, white robed inhabitants worshipped their awesome God in the hermitic and cenobitic style: maintaining silence, livings in cells, praying together whilst contemplating alone – remaining ‘steady [to the Cross] while the world is turning’. It is also home to a spectacular collection of art. The central church, assembled at vast cost, is a virtual who’s-who of Neapolitan artists from the 17th and 18th century – Di Ribera, Caracciolo, Fanzago et al. It’s a baroque vision of beautiful side chapels, exquisite marble floors, hand carved stalls and devotional works of Christ and the Saints. Surrounded by this splendour and in their religious isolation, the monks who lived here must have had a very odd relationship with the city above which they sat: living in Naples but separate from it; in reach of the city but unable to touch it. Even today, the place remains quiet, peaceful, holy and sacred – very different from the frenetic, crowded, raucous, very human, and profane Naples below. 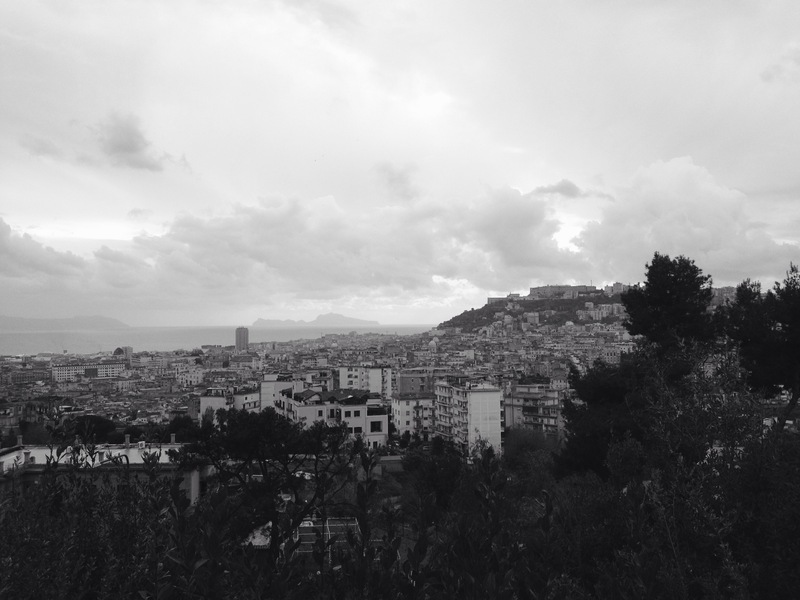 Downtown Naples as seen from Capodimonte yesterday. Unfortunately the large park behind the old Royal Palace was closed to visitors but there was still the opportunity for a Sunday stroll to walk off some of the Christmas turkey. As you can see, the weather has taken a colder turn and rain was in the air – fa freddo! 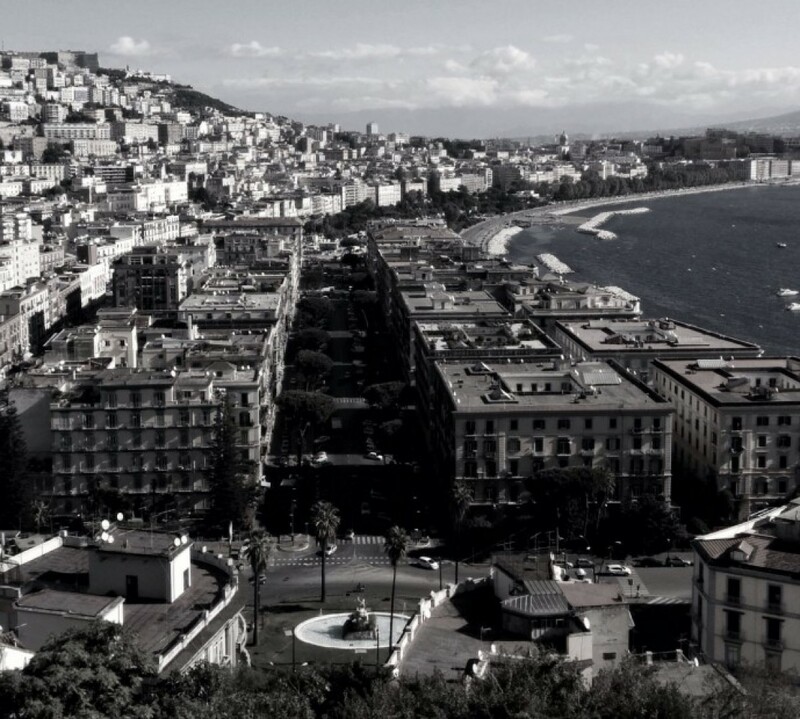 Naples – Do you Love it or Hate it? Naples has divided and continues to divide opinions sharply. ‘Naples is an ill-built, ill-paved, ill-lighted, ill-drained, ill-watched, ill-governed and ill-ventilated city’. 1884 edition of Cook’s Tourist Handbook. ‘There are places that you go to, and once is enough. And then there is Napoli’. John Turturro, Passione. ‘There is nothing on earth that I have seen so dirty as Naples’ as he decried the ‘miserable depravity, degradation, and wretchedness’. Today, although observers broadly agree about the merits of the many attractions around the city, including Pompeii, Sorrento, the Amalfi coast and of course Vesuvius, and will rave together about the food, the weather and the beauty of the area, downtown Naples remain like marmite – you love it or hate it. Supporters, like in this NYT article, note the passion and vibrancy of the city, the multiple layers of history, the sense of human drama played out on narrow streets framed against the Bay of Naples, the quality of the art, not least that of Caravaggio, and the spirit of old and young alike, living cheek by jowl in a crowded, spawning megapolis, the sixth biggest in the EU. Moreover, they assert, Naples is on the rise and is being taken forward by a dynamic, reforming mayor. On the contrary, the naysayers assert, Naples remains a lawless, overcrowded, smelly, dirty, crime -and rubbish-ridden slum best avoided. Many tourists agree and never venture into the narrow, dark streets. As ever the truth lies somewhere between the two extreme positions. This occasional blog will try and look below the stereotypes by exploring the culture, history, food and art of the capital of southern Italy and its hinterland, the Mezzogiorno. Certainly life here can be frustrating but it is never dull.